Despite all the information we’ve discovered from our telescopes and outer space missions, there are still many puzzles to solve in our own solar system. Sometimes, it seems the more we learn, the more mysteries we uncover. Venus has a hot, cloudy, dense atmosphere that shields its surface from the view of orbiting spacecraft in visible light. To date, the only way to map the surface has been to direct radar through the clouds and reflect it off the planet surface to measure elevations. We’ve also observed radio emissions from the planet’s hot surface. 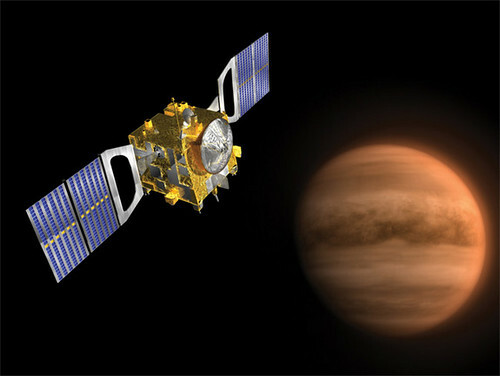 When NASA’s Magellan spacecraft last visited Venus 20 years ago, we discovered two mysteries that have yet to be solved. First, the higher the elevation on Venus, the better (or “brighter”) the radio waves reflect off the surface. Something similar happens on Earth but with visible light. That means we see cooler temperatures at higher altitudes. Think of how the warm surface of the Earth can transition to ice and snow on a mountaintop. That’s our brightening pattern in visible light. For the same effect to occur on Venus when we can’t see the surface in visible light, scientists believe there may be a chemical weathering process that depends on the temperature or a type of heavy metal precipitation that acts like a heavy metal frost. The second mystery is that we get radio dark spots at the highest altitudes on the planet’s surface. For example, scientists saw lower radar reflections at 2,400-meter (8,000 ft) altitudes then a rapid brightening (or increase in radio reflections) as the elevations rose to 4,500 meters (14,750 ft). But by 4,700-meter (15,500 ft) elevations, they got many more black spots, sometimes numbering in the hundreds. Those places go radio black.